Tourism has come to occupy, relatively suddenly, a central place in the economies of Caribbean nations previously reserved only for sugar and tobacco, and to a lesser extent, for coffee. It is now the primary source of foreign currency at each of the 30 or so Caribbean destinations, excepting the case of Cuba, where until recently the monetary remissions that Cuban-Americans send to their families in Cuba arguably exceed the net revenues from tourism on that island. This recent Caribbean explosion in mass tourism has not been studied very comprehensively in terms of its effects writ large—on society, on culture, on business, and on politics. Part of the challenge in understanding the impacts of tourism involves the multi-disciplinary nature of tourism itself; single disciplines can contribute to an understanding of these impacts but only from the isolated perspective of particular disciplines. So there appears to be a notable dissonance between policy conclusions and recommendations of scholars on the one hand and the behaviors and actions of the policy-makers with responsibility for tourism in those Caribbean destinations, on the other. Tourism research is a relatively new interdisciplinary area, comparatively immature in its theories and accepted approaches. Tourism’s evolution from its early days when only wealthier individuals traveled, to today’s mass tourism has been facilitated by economic conditions, access to mass travel, and information and communication technologies. Jafari has noted that tourism research has evolved from advocacy to caution and now to adaptation. The early attempts to study tourism, according to Jafari, fell mostly within single disciplines, and primarily served as advocacy for all that was considered good about tourism, generally promoting tourism’s worldwide development and expansion (Jafari, 2002). After this initial stage, a second phase of research emerged, a cautionary one, emphasizing the economic and socio-cultural costs of unplanned tourism. Finally, a third, and more recent, research stream has appeared, this one encouraging adaptation, but arguing that not all forms of tourism are the same and favoring certain types. 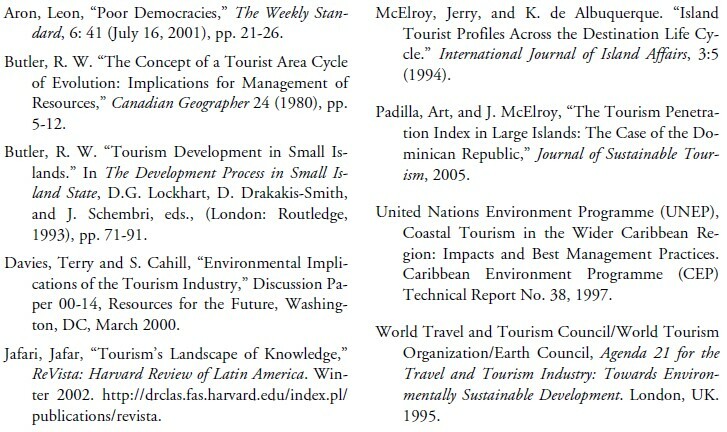 Some, such as ecotourism, small-scale tourism, and cultural tourism, are more desirable, according to this more recent body of work. These three strands of research have merged over time as newer efforts covering a wider spectrum of tourism questions now fill professional journals. However, in spite of these trends, most studies continue to be conducted within the framework of single disciplines, whether it is sociology, economics, management, or political science. Predictable outcomes, indeed perhaps even necessary ones, are the conclusions and policy recommendations derived from those particular disciplinary perspectives. This is most notable in areas like the environment or crime, where policy conclusions often disregard the potential impact of one or another discipline. For example, many studies about the impacts of tourism on the environment are silent about the political and economic realities of developing economies or of the pressures facing their political leaders. Without these fuller, more inclusive treatments, policy conclusions will be incomplete and often of limited utility to policy makers who have the elected authority and the responsibility for the conduct of tourism policies and practices in their nations. Indeed, many or most tourism issues are at the interface between the economy, business, politics, society, and the environment. For fragile and bio-diverse environments, such as those found in the Caribbean, all of these issues intersect in ways that conflict and create challenges. In a very real sense, tourism in the Caribbean confronts the twin challenges of sustainable and development: the “sustainable” side of the twin problem affects mostly the environment, but also the culture and the sociology of a region; the “development” deals with the capacity of poor countries to achieve higher levels of well being. Only a comprehensive approach can begin to serve some usefulness to the people who ultimately make the decisions about the scope and type of tourism experience that will exist. In this paper I apply a multi-disciplinary approach to analyze and examine the anatomy of tourism in the Caribbean, with its implications for tourism in Cuba. Thinking about tourism from a multidisciplinary perspective with broader emphases allows one to view the inter-connectedness of issues. At the same time, such general approaches run the risk of not being entirely suitable for specific situations or locations, thus leaving authors notoriously exposed to criticism about the details. So the present effort is presented as a beginning toward a more general theory of tourism, one that allows for the inter-connections of various approaches, and that ultimately might lead to a fuller and more useful understanding of the challenges and opportunities in Caribbean tourism. I use the metaphor of the three Cs—context, characteristics, and consequences—to develop a general framework around which to view the phenomenon of tourism. These three aspects are, of course, closely related to one another and each is affected by and embedded within the others. Ultimately, as an ensemble, the three Cs determine the entire configuration of tourism at a particular destination. The first of the Cs, context, represents the macro-environment around which tourism takes place, and contains those economic, political, social, environmental, and historical elements that uniquely influence the development of tourism at a particular destination or country. The second of the Cs, characteristics, defines the types of tourism that prevail in, or characterize, the tourism experience at a particular region or destination. Examples would be all-inclusive resorts, ecotourism, cruise ship tourism, and other smaller, perhaps more traditional, sorts of tourism. The final C, consequences, depicts the results, both positive and negative, that obtain from the interaction and combination of the first two, context and characteristics. In developing this general anatomy, I will use the case of the Dominican Republic and the Turks and Caicos as illustrations, and then I will extend these results to the Cuban case, both in the present situation and speculatively, in a post-Castro scenario. The context of tourism reflects the macro-environment within and around which tourism takes place. Every tourism destination exists within its own unique macro-environmental context, but this context has several elements shared in common by all destinations and countries. There are five important context categories: (1) economic forces and conditions; (2) political, legal, and regulatory; (3) social and cultural; (4) environmental, geographic, and topological; and (5) historical. 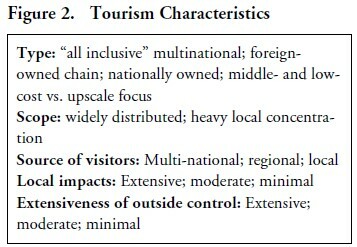 Each of these factors can have dramatic effects on tourism strategies and possibilities, but most of them are largely outside the immediate control of individual nations or governments because they either reflect a long history of development or are determined in the main by external forces and events. The economic forces and conditions include the economy’s growth rate, the characteristics of the workforce, and the other important economic sectors, including those that contribute or that “produce” inputs for the tourism industry. Tourism is a viable “export” for Caribbean nations, particularly if they can capitalize on what they already have. But if they do not have a furniture industry, or airports, hydroelectric plants, and medical facilities or hotels, then the governments face a choice: to finance domestic production or to import from the outside. Governmental and political contexts are equally relevant to the calculation of the net benefits that accrue from tourism. Until fairly recently, democracy was rare in the “less developed” nations, but now there is a host of new, but poor, democracies. Several destinations in the Caribbean fit this category, but there are also several in Europe and Central and South America. 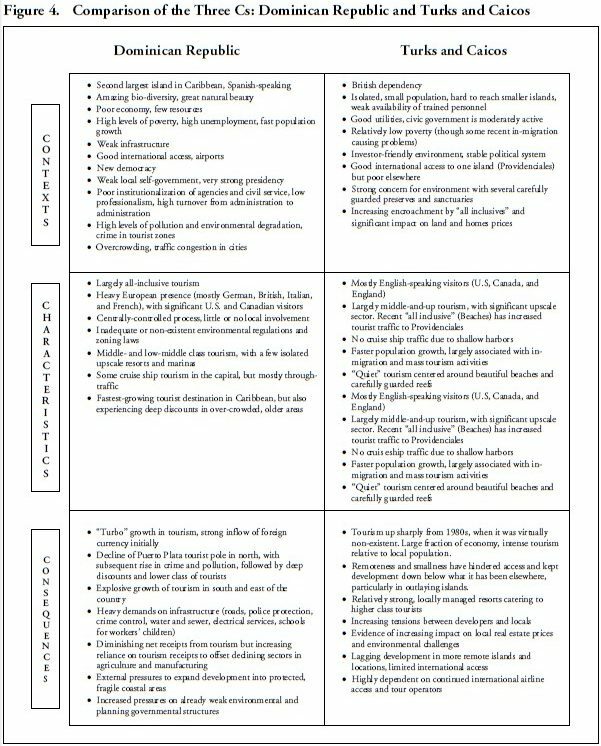 These may be called “bare bones” democracies that are facing real economic and political challenges (Aron, 2001). Their civic governing cultures are highly underdeveloped as well, in contrast to those of the older democracies like those found in the U.S. and in Europe. Citizens enjoy many of the benefits of democracy (free speech, freedom to travel abroad, free assembly, elections, newspapers), features that distinguish them from non-democracies like North Korea or Cuba, but also from pseudo-democracies like Egypt or Malaysia. In these poor democracies, there are also other important features with potential and actual implications for tourism: corruption is rampant and, ironically, now more visible than ever due to the free press; weak democratic institutions, including an absence of a local culture of self-governance. (In wealthier Western nations, local self-government preceded national democracy by centuries.) Decisions about tourism, both due to the small size of the nations and destinations, but also to the absence of effective local voices, tend to be highly centralized and without any input from local communities. Social and cultural forces are both responsible for tourism and at the same time the victims of its success. Tourists look, but the locals look back, often seeing wasted food, scantily clad men and women, freely flowing alcohol, all of which is disruptive of local traditions. “Garrison” tourism helps to prevent crime and limits cultural interactions, but also reduces significantly the amount of revenues flowing into local economies and the development of local talent and capital. It tends to exclude locals from the decision- making process as well. Tourism in the Caribbean is, at its heart, about the environmental experience. Adequate hotel rooms and good restaurants are available in every part of the world. It is the sand, sea, sun, and cultures of the various destinations that provide the region’s sustainable advantage over other areas. Caribbean tourism is concentrated on fragile coastal areas. Increasing degradation of coastal and marine environments, as well as dislocations in the social fabric of coastal communities, threaten this competitive advantage. Every Caribbean country experiences some form of impact, depending on the kinds of governmental standards and the professional infrastructures that exist, most significant enough to warrant implementation of major rehabilitation projects (e.g., Osama River harbor in the Dominican Republic, Havana harbor in Cuba, or Kingston Bay in Jamaica). But poor democracies operate with weak regulations and planning guidelines. There is inadequate legislation, monitoring systems are weak, and there is low institutional capacity or awareness. Coastal degradation represents a mixture of public sector inadequacies and unregulated actions of industry developers, and of course not all is due to tourism in certain areas. In contrast, some nations, such as Costa Rica, have developed expertise in certain kinds of environmental tourism and have a fairly well developed professional expertise that serves as advocates and monitors. Smallness and remoteness can be an advantage (a unique “product”), but it cuts both ways: it means lack of trained human resources; no capital; marginal international air routes; lack of access to global distribution systems. In addition, each Caribbean destination has its own particular history that informs how tourism has developed and grown there. It affects everything, from the location of tourist destinations and amount of land devoted to them, to the kinds of touristic investments that are attracted and made. Depending on the macro-environmental contexts prevailing at a given destination, tourism will display different characteristics, ranging from a heavy concentration of “all inclusive” tourism, such as exists in the Dominican Republic, to primarily boutique, upscale resorts such as those found in Nevis or in parts of the Turks and Caicos. The interaction between the contexts and the characteristics is quite real but seldom simple. The heavy dependence on foreign-owned “all inclusives” in most areas of the Caribbean create all sorts of challenges for the host nations, and these challenges are magnified at the local level due to the absence of effective local self-governments. Typically, the European all-inclusive operations are heavily vertically integrated: they have their own management structures, their own architects, their own hotels, and their own airlines. The tour operators from the nations sending the tourists are thus extremely powerful vis-a-vis a small Caribbean destination, and they tend to set the rules regarding occupancy and pricing. In fact, only a handful of very large conglomerates control 70-80 percent of the tourism business in Europe, and they have great influence over the pricing of products. Touristik Union Internationale (TUI) from Germany, the largest tourism conglomerate in Europe, included as of 2004 over 3,600 travel agencies, 104 aircraft, and 285 hotels (including brands like Iberotels, Sol y Mar, and RIU) with over 157,000 beds in 25 countries. Around 12,000 business travel professionals in over 70 countries also look after the TUI’s business customers. (See the company’s web site at http://www.tui.com). The terrorist attacks of September 11, 2001, of course have had great impact on both the tourism industry and on the way tourists make their travel plans. For one thing, there has been a consolidation in the industry, accompanied by heavy focus on cost controls. Thompson UK, for example, has been taken over by TUI; Thomas Cook UK has been acquired by C & N from Germany; and Appollo in Sweden has been taken over by Kuoni of Switzerland. To make matters more complicated for the smaller nations dependent on foreign travel, consumers have been making later and later plans for travel and more travelers are making last-minute plans. For instance, over half of the bookings in Germany during 2003 were made within two months of the date of travel, compared to more usual six months to a year before, and most of Italy’s travel plans are being made even closer to the date of travel. Increased used of the Internet for bookings indicates that pressures for additional cost savings will be stronger in the future as consumers can more easily shop around for the best fares and hotel prices. If hotels want high occupancy rates, the giant conglomerates might demand lower prices or cheaper packages on shorter notice, leaving even less for the local economies that depend on tourism. As prices fall, the local maintenance and repair budgets decline, including those for water treatment plants, if they exist, and for aqueducts, all of which has an impact on the class of tourist that is attracted. The consequences that flow from the first two Cs result in both negative and positive impacts, particularly in the areas of the local and national economy, environment, infrastructure, and cultural and social activities. 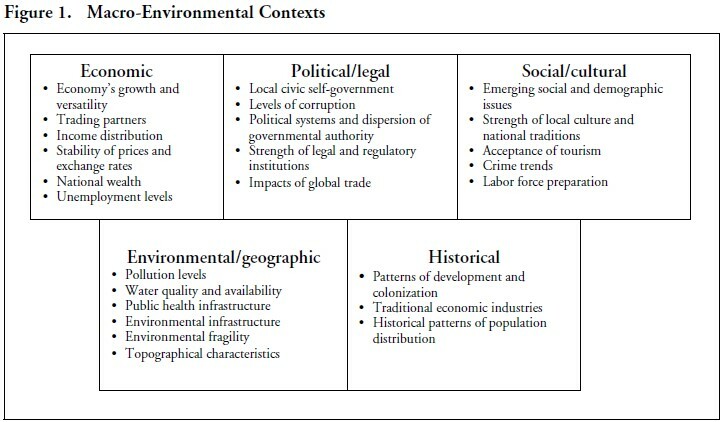 Butler’s (1980 and 1993) well-known lifecycle model suggesting that as tourism destinations develop, they pass through predictable stages involving increasing facility scale, capital intensity, and socio- environmental encroachment, would be subsumed under the scope of this more general framework. Among the positive outcomes, of course, are the net inflows of foreign currency, the improvements in infrastructure due to tourism (better roads, airports with a greater number of flights, police enforcement), and enhanced international reputation and publicity for the country. Among the negative consequences are environmental and coastal degradation, loss of prime lands and beaches, increased crime and illicit activities, and over-construction and overcrowding, with the attendant negative consequences on local populations. Thus, while tourism brings important benefits to small island nations with few or no other options, it also brings negative consequences that partially offset many of the positive ones and that flow rather directly from the contexts and characteristics of that destination. The Dominican Republic and the Turks and Caicos represent rather extreme examples of Caribbean tourism: one with explosive growth, primarily in the allinclusive mode, an example of one of the “bare bones” democracies, developing slowly a better understanding of tourism and its effects and how to control them, moving toward less dependency on allinclusives, and another a British overseas territory, starting out slowly in the “boutique” and upscale markets, but now facing economic and environmental pressures as it moves toward a greater emphasis on mass tourism, but with greater strength in their “civic” or local governments compared to the Dominican Republic. The contexts and characteristics of the Dominican Republic may be summarized as follows. First, the Dominican Republic is a relative newcomer to democracy, and its civic and local self-government institutions are in a comparatively early stage of development. Its governmental agencies, particularly in the areas of environmental oversight and tourism planning, are not well-staffed with professionally prepared individuals and suffer also from a lack of continuity due to frequent civil servant turnover from government to the private sector. The nation’s infrastructure, its roads, electrical and power systems, educational institutions, and labor force preparation are below standards. Rapid population growth coupled with an absence of local wealth and capital have put great pressures on its government to pursue mass tourism to replace traditional industries that have declined, financed by external entities with government guarantees and tax and land incentives. • Punta Cana/Bávaro in the east. Tourism began in the Puerto Plata region, boosted by U.S. and, to a lesser extent Canadian visitors, initially. Consistent with Butler’s theory of rise and fall of tourist destinations, weak governmental oversight and corruption led to a decline in the infrastructure of the region and in the overall quality of the resorts (with some exceptions), and this in turn led to heavy discounts and a different class of tourist. Crime also increased over the last twenty-five years. As Puerto Plata matured and declined, the other areas developed and flourished. Foreign investors developed various resorts and golf courses in La Romana region and then more recently, an explosion of “all inclusive,” foreign-owned hotels opened in the previously uninhabited region of Punta Cana and Bávaro on the eastern-most tip of Hispaniola. The highly-profitable airport at Punta Cana is the largest privately owned international airport in the world. Ironically, it was going to be built by the government, but in the end had to be built by private interests. Even though the Punta Cana region boasts several relatively “upscale” resorts, there are increasing signs of over-development in the area today, though it remains the fastest growing tourism destination in the Caribbean. The Turks and Caicos pattern of development was quite different, reflecting its own unique contexts and characteristics, though ultimately, as another Caribbean destination, it shares several patterns and trends with the Dominican Republic. Aside from the obvious size differences between the Dominican Republic and the Turks and Caicos, the Turks and Caicos have had a long association with England and have had a stable political situation during its history. Besides its main industry of tourism, the islands have a significant offshore banking industry and some fish and lobster exports. The sharp increase in tourism activity in the Caribbean during the 1990s was shared by the Turks and Caicos, and annual visitors now exceed 200,000, or over 10 times the resident population, making these islands one of the most tourism “penetrated” destinations in the region and world (Padilla and McElroy, 2005). While it maintains a slow pace and upscale flavor to its tourism, the rapid growth of tourist arrivals are creating challenges to the environment and local culture. In many ways, the Turks and Caicos is better equipped to handle these issues since it has strong civic institutions and balance between development and environment. However, the very attributes that make Caribbean destinations unique and attractive are the same things that require the most care. As the economy grows, it also grows more dependent on tourism funds, and small numbers of eco-tourists or reef divers cannot supply the same currency needs as can mass tourists at all-inclusive resorts. This is a dilemma of all Caribbean destinations that are increasingly dependent on mass tourists. 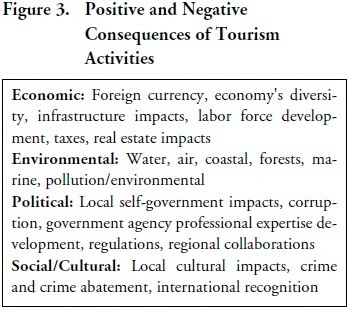 Under present conditions, tourism activities in Cuba are fairly easy to analyze with the three Cs model. The absence of a private sector in Cuba implies that Cuba’s conduct of tourism activities is among the most centralized in the world. The control of tourism by a centralized apparatus determines the pace and location of tourist facilities, as well as who works in the tourist economy. Cuba’s deliberate decision to conduct what has been described as “apartheid” tourism keeps local populations largely and artificially away from the tourists, thus minimizing local cultural and political impacts. The placing of massive, externally- financed hotels and resorts in protected beaches and offshore keys and deserted islands further tends to mask local concerns or disagreements that arise from mass tourism’s inevitable impacts on local cultures. At the same time, Cuba’s socialistic economy is too inefficient to take advantage of this government monopoly of tourism and it suffers from a severe lack of capital, thus making it highly dependent on the European and Canadian hotel chain owners. One consequence is a massive leakage of mass tourism receipts compared to other Caribbean nations, estimated in the range of 85 percent. Mass tourism places great strains on roads, transportation systems, fragile environmental areas, and on public utilities. For example, it is estimated that a tourist uses ten times more water each day than does a local resident (World Travel and Tourism Council, 1995; Davies and Cahill, 2000). The strains on the infrastructure are made worse due to the relative lack of funds to repair and improve it. The system is also inefficient in preparing workers and managers for the industry. It is more difficult to discuss the model under conditions that might exist after Castro departs because so much depends on how the economy and the political systems will diverge from the current situation. A transition toward democracy and private property rights under a new or revised constitution would generate the most impact and the same sorts of pressures and challenges highlighted above for the Dominican Republic and Turks and Caicos would obtain in Cuba. A particular emphasis and focus on two aspects would in that case seem highly indicated to avoid many of the problems plaguing Caribbean destinations today: the “jump-start” development of strong local governments and the preparation of a professional cadre of environmental scientists and regional planners with independence of action and support from government leaders. The relatively simple but analytically powerful “Three Cs” framework brings a multi-disciplinary, general framework to the analysis of tourism problems, enabling a deeper and more comprehensive understanding of the issues and challenges. It is broad enough to fit the wide variety of destinations and can therefore result in better policy conclusions.